CVS is right across the street from my job and im always in there looking for a new beauty product. I recently ran out of my M.A.C makeup wipes and decided to try something else. I decided to try out just the basics because i was attracted to the simplicity of the packaging LOL! These wipes are only $2.99 for 30 wipes and boy are they amazing. The wipes are large and sturdy. One wipe will definitely remove an entire face of makeup with ease. 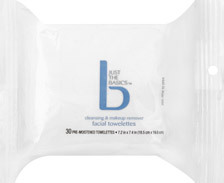 I think i may like them more than my M.A.C wipes...you really cant beat the price. Gotta love CVS! I spend waaayyyyy too much money there.